The AccuCount series of automated colony counters are designed to count macroscopic and microscopic objects in a field displaying totals on a highly visible digital readout. The AccuCount 1000 is ideal for the AMES Assay using 35 to 100 mm petri dishes or 6, 12, and 24 format multi-well dishes. The transmitted illumination can be used whenever analyzing objects on a translucent or transparent background. Transmitted darkfield capability assists in analyzing transparent or low contrast objects. The reflected illumination makes it possible to analyze objects on opaque backgrounds, such as blood and chocolate agar. 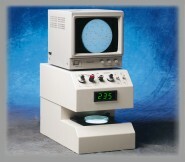 The AccuCount's outstanding sensitivity and resolution permits counting of a wide range of object types and sizes, including bacterial colonies, cells, and industrial particles. The AccuCount 2000 automated counter is designed to automatically count microscopic objects in a field displaying totals on a highly visible digital readout. Its outstanding sensitivity and resolution permits counting of a wide range of object types and sizes, including bacterial colonies, cells, grains and industrial particles. The AccuCount 2000 is ideal for scoring Unscheduled DNA Synthesis slides and the Mammalian Cell Mutation Assay. 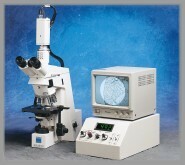 The external video camera can be easily interfaced to a wide number of microscopes.